GP > RN & CB The EU Plotters Plan Unravels On Ventotene Where It Began! GP &gt; RN & CB The EU Plotters Plan Unravels On Ventotene Where It Began! The EU Plotters Plan Unravels On Ventotene Where It Began! The secret history of the EU, written on an Italian prison island, reveals why the project is doomed! 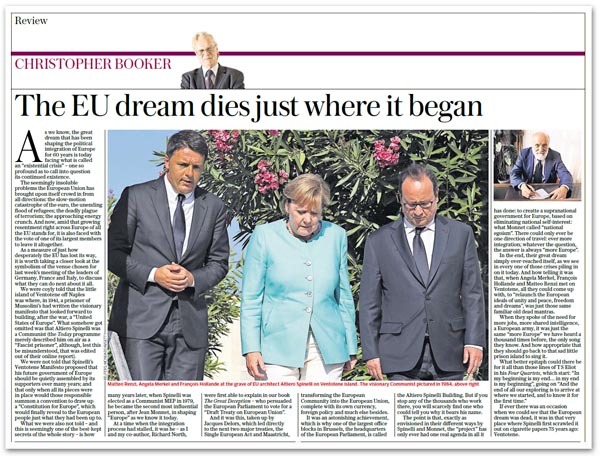 As we know, writes Booker, the great dream that has been shaping the political integration of Europe for 60 years is today facing an existential crisis. 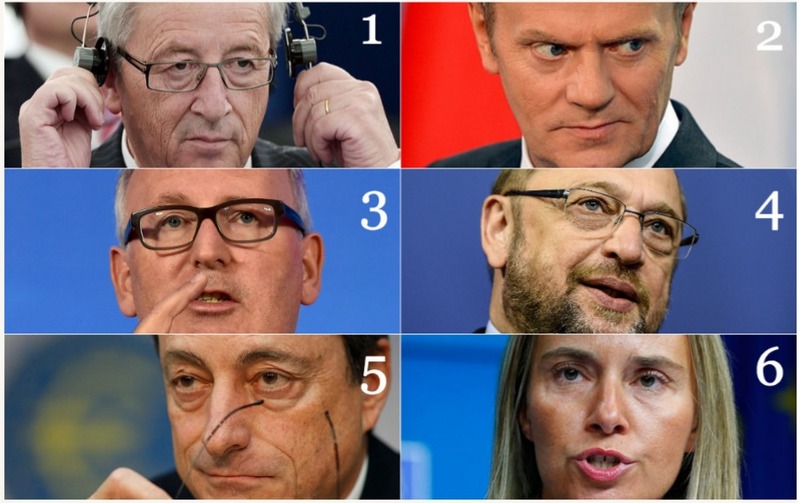 The seemingly insoluble problems the European Union has brought upon itself crowd in from all directions: the slow-motion catastrophe of the euro, the unending flood of refugees; the deadly plague of terrorism; the approaching energy crunch. And now, amid that growing resentment right across Europe of all the EU stands for, it is also faced with the vote of one of its largest members to leave it altogether. As a measure of just how desperately the EU has lost its way, it is worth taking a closer look at the symbolism of the venue chosen for last week’s meeting of the leaders of Germany, France and Italy, to discuss what they can do next about it all. We were coyly told that the little island of Ventotene off Naples was where, in 1941, a prisoner of Mussolini’s had written the visionary manifesto that looked forward to building, after the war, a “United States of Europe”. What somehow got omitted was that Altiero Spinelli was a Communist (the Today programme merely described him on air as a “Fascist prisoner”, although, lest this be misunderstood, that was edited out of their online report). We were not told that Spinelli’s Ventotene Manifesto proposed that his future government of Europe should be quietly assembled by its supporters over many years; and that only when all its pieces were in place would those supporters summon a convention to draw up a “Constitution for Europe”, which would finally reveal to the European people just what they had been up to. What we were also not told – and this is seemingly one of the best-kept secrets of the whole story – is that many years later, when Spinelli was elected as a Communist MEP in 1979, he became the second most influential person, after Jean Monnet, in shaping “Europe” as we know it today. At a time when the integration process had stalled, it was he – as I and my co-author, Richard North, were first able to explain in our book The Great Deception– who persuaded the European Parliament to vote for a “Draft Treaty on European Union”. And it was this, taken up by Jacques Delors, which led directly to the next two major treaties, the Single European Act and Maastricht, transforming the European Community into the European Union, complete with its own currency, foreign policy and much else besides. It was an astonishing achievement, which is why one of the largest office blocks in Brussels, the headquarters of the European Parliament, is called the Altiero Spinelli Building. But if you stop any of the hundreds who work there, you will scarcely find one who could tell you why it bears his name. High Representative, the EU’s foreign secretary. Former Italian socialist foreign minister. The point is that, exactly as envisioned in their different ways by Spinelli and Monnet, the “project” has only ever had one real agenda in all it has done: to promote a supranational government for Europe, based on eliminating national self-interest: what Monnet called “national egoism”. There could only ever be one direction of travel: ever more integration; whatever the question, the answer is always “more Europe”. In the end, their great dream simply over-reached itself, as we see in every one of those crises piling in on it today. And how telling it was that, when Angela Merkel, François Hollande and Matteo Renzi met off Ventotene, all they could come up with, their wish to “relaunch the European ideals of unity and peace, freedom and dreams”, was just those same familiar old dead mantras. When they spoke of the need for more jobs, more shared intelligence, a European army, it was just the same “more Europe” we have heard a thousand times before, the only song they know. And how appropriate that they should go back to that sad little prison island to sing it. What better epitaph could there be for it all than those words of T S Eliot in hisFour Quartets, which starts: “In my beginning is my end… in my end is my beginning”. It goes on: “And the end of all our exploring is to arrive at where we started, and to know it for the first time”. If ever there was an occasion when one could see that the European dream was dead, it was in that very place where Spinelli first scrawled it out on cigarette papers 75 years ago: Ventotene. Next Next post: Nigel Farage Made Ukip But Clearly He Ensured Its Destruction Due To Ineptitude!